The unique Flamenco theater in the world. For the first time, the magic of the Flamenco singing, dancing and guitar will take the stage of an intimate and cozy theater all together. One of the most emblematic theaters of the Flamenco capital in Spain, Madrid. The audience will experience the passion of the pure and traditional Flamenco with great musicians and dancers who will combine their art in two daily shows. Do not miss this unique experience of living and feeling Flamenco; Intangible Cultural Heritage of Humanity. 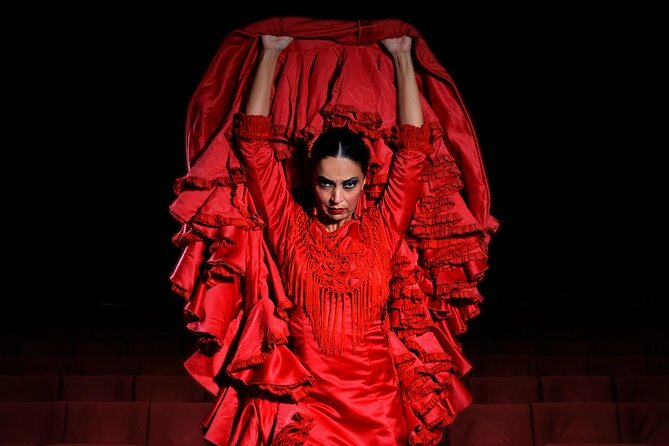 • We are the only flamenco theater of the world with daily programming and different shows. • So are our shows, intense and close with only five artists on the stage that take us through all the sticks that are based on these three basic pillars: GUITAR, SING AND DANCE. • Please note that our bar service is available to order up to 5 minutes before the show starts. • The doors open 30 mins the show time. • Change of date can be requested up to 24 hours before the show. Flamenco Theatre Madrid will reimburse the full cost of tickets cancelled up to 24 hours before the start of the show 50% of the cost of tickets cancelled up to 12 hours before the start of the show. The ticket is not nominative is transferable. Flamenco Theatre Madrid is not responsible for replacing refunding tickets in the event of loss theft. Flamenco Theatre Madrid reserves the right to modify (date, time artists)cancel the scheduled show in the event of technical artistic problems reasons beyond its control.